A year wasted. That's how Sarah Eva Howe recalled 1892. In that year, multiple illnesses struck, one after the other, keeping her in bed or inside for months, sometimes with her eyes bandaged shut. We can only imagine the challenge of keeping that gregarious, inquisitive 8-year-old girl quiet long enough to heal. Sarah wrote the following memoir in the 1940s, remembering that trying time and attributing some of the ailments of her adult years to that barrage of illnesses that plagued her some 50 years before. The winter after Christmas [of 1891] was one long series of mishaps, physically. A brand new disease was sweeping the country (new in name if not in action). La Grippe [an old word for influenza] was its French cognomen, and this was its first introduction to America. (“The la grippe,” as many called it.) Mama1 had a very bad attack of it, and I took it before she recovered and was put in bed with her. 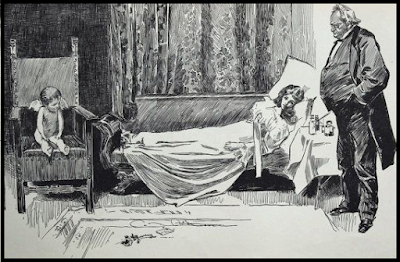 Dr. Goslee was run to death, poor man, and a young doctor about 28 named Dr. Holmes, a tall, silent, rather grim, dark young fellow said to be quite a brilliant student and practitioner, had to be his assistant and took over our cases. I think this was in January, and we were in bed at least two or three weeks. With my case, erysipelas set up, my cheek was puffed up in a blister, I was painted with brown ointment (probably fish scale preparation, for it smelled terrible!) and with the grease used around my neck, my hair on end and all, I remember looking in the hand glass and deciding I looked exactly like an Indian. That kept me from school about a month. When I went back about the first of March, I had a queer accident. The family had a dining at Grandma Howe’s2 house, down on Main, and I was allowed to come home to eat with them, but (as I had missed so many days) was to my sorrow not allowed to stay from afternoon school. As I hurried out to go, I fell, the day being misty on the damp concrete pavement, and I made a brush burn — with no one knows what germs burned in — on the left side of my face. I went on to school after washing up, and by night it felt like it was afire. All might have gone very well, tho, if almost immediately, while my face was still sore, around late March ... I came down with a particularly bad case of the measles! (Very hard cases, that year.) Weakened by first the grippe, and erysipelas, then the infection in my cheek, which was so slow healing, then the measles, something had to give way, so my eyes did. How long I was in the dark room or, if I went out, had a bandage over my eyes, I don’t know — most of April and part of May, I suppose. I remember Jenne3 and the other children bringing me violets and plum blossoms, and smelling them. 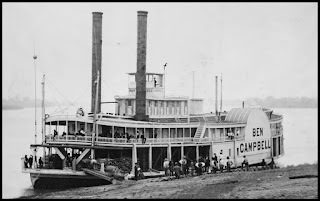 the boat with my eyes bandaged — I could see just a gleam of the boat lights on the grass at my feet — and being taken away for a stay at Grandma Cost’s4 and daily trips to the doctor. It seems there were already two ulcers on the left eye, which when healed left scars that always made me see a little less well with that eye; when many years later I had an ulcer on the right eye, I believe it was because so much work had been put throughout the years on that which I considered my good eye, but which, alas, is now pretty well played out from hard labor while the lame left is the main eye “left” me to see with! Anyway, there were two scars left on the eyeball at that time. I have told this in more detail than it needed, perhaps, because of the eye trouble I have now, for which this is perhaps the explanation — certainly the start of it. But the loving, constant care given me by Mama, who gave up everything to read to me by the crack of light at one window of my room (we didn’t have "masks" [eyemasks] then!) brought me through, and by summer I could play outdoors again, but wearing, during June, dark glasses, and later pale blue ones. I was allowed, I think, to go back for the last day of school, tho I don’t remember it, and may have been at Cincinnati at the time, as it was about the middle of May. vista of Greek and Roman Tales to my astonished and enraptured vision. ... My favorite was Perseus and the Gorgon’s Head. Mama had studied Mythology at school too but had not read the Hawthorne fuller version, so she was interested in the stories I could tell her that Aunt Lee had just recounted to me. She was giving me a bath as I glowingly told her about Perseus and his disappearance from view: "for Mama, he had on the Helmet of Invisibility.” She was so astonished at the fluent use of this new big word she remembers the time vividly. I do wish we had the “old readers — probably priceless early McGuffey’s Mama used to read to me from — given her by the aunts and uncles from early school days. “Meddlesome Matty” was in them — also “Everything in its Right Place," not the Hans Anderson story but the story about the little girl who never put anything away, and the angry fairy who commanded that each part of her should go to the portion of her attire [that was] in the wrong place in the room! So her head went under her plumed hat on the water pitcher, her foot into a shoe under the bed, another into one under a chair; her hands into gloves thrown far and wide . . . her dress being backbreakingly across the foot of the bed, etc. Horrific pictures accompanied this supposed-to-be-lively farce for little minds of 8 year olds. Much better was the story of "Frisk," the dear little dog whom Harry his master had teased and tormented till his mother made him spend the afternoon in bed, while all the other children were having fun gathering pears. As he lay there, he heard pat, pat coming up the stairs, and there came Frisk, carrying a pear by the stem and leaves! Harry cried and petted him and of course vowed never to worry him again. 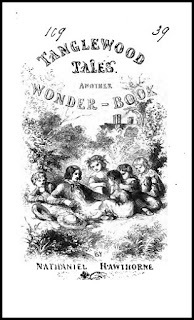 6 Books for children by Nathaniel Hawthorne. Tanglewood Tales – Another Wonder Book is a sequel to Wonder Book.